Just 150 years ago it took months to travel from New York to California by covered wagon. But in today’s globalized world, communicating with virtually anyone on the planet is a matter of touching a button, and traveling from New York to California takes a mere five hours. Enter one of the most important inventions of our time - the jumbo jet. And enter two bold entrepreneurs who sought out business partners in a most unlikely place. 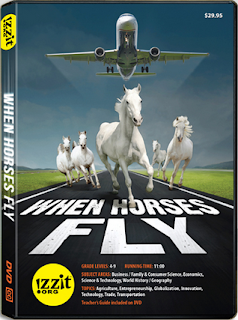 Come along as 47 prize-winning thoroughbred race horses journey halfway across the globe and marvel in the fact that somewhere a horse is in flight every day of the year. Learn how airfreight, more than just a way to get consumer goods in a hurry, is a global platform from which unique business partnerships are born. Teacher of the Year winners!